Are we the only ones who feel that our lives need a major overhaul sometimes? All too often, we’ve sensed the need to change our attitudes, our diet, our priorities, our hobbies… the list could go on and on. Reorganizing your priorities can be an incredible blessing, and we recommend you do some soul-searching and try it. 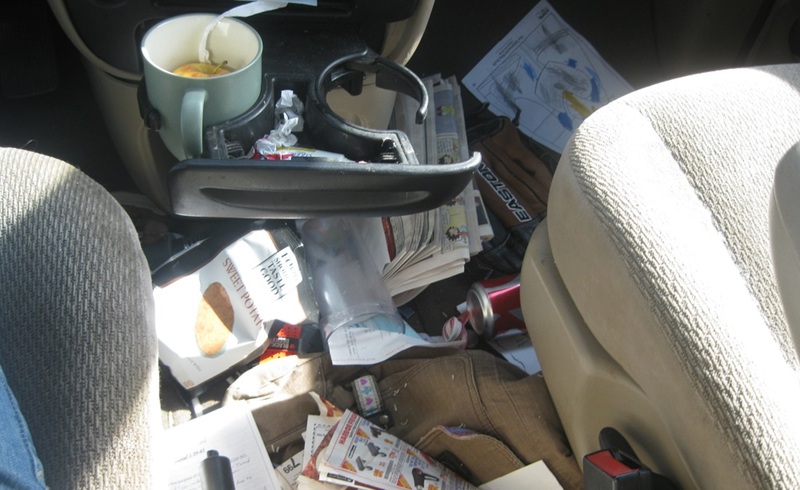 However, we’re here to offer a far quicker and easier change that can help overhaul and organize a tiny part of your life to make room for the big and more important organization projects: cleaning your car. 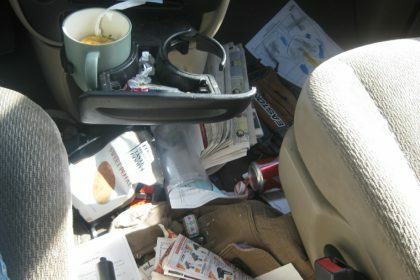 Yes, your car’s organization and cleanliness may not be on the list of life-changing projects, but it can go a long way toward peace of mind and efficiency so that you can make space on your list for the big stuff. And, since you spend so much time in the car, often with family and friends, it is a start toward better living. A trash bag – This alone could revolutionize the way you travel. Got empty water bottles? Old Cheerios or Cheezits? Used Kleenexes? Old gas station receipts? We know you do—that and more. Designating a place for your trash keeps it out from underfoot and out of sight. Then, it’s easier to clean out regularly. The best way to keep your car clean is to empty or throw out and replace your old trash bag every day, but if that’s ambitious or you’re just not that trashy, try setting a weekly date to take out your trash. Remember: taking out the literal trash helps set up your mind to take out the figurative trash cluttering your life! Folder for your glove box – You’ve got critical papers in your car: your registration and insurance information, for starters. A folder, envelope, bag, or binder for these papers to tuck in your glove box is an invaluable way to organize. A needs box – There are some things you just need in the car: Kleenexes, an emergency kit, an umbrella, your favorite lipstick and your toddler’s favorite car toy. Keeping these items in the console or a designated box will ensure easy access and a floor free of clutter. Toy bags – If you’ve got kids, you’ve got a million car toys, from stuffed animals to action figures to crayons. A Ziploc bag, plastic bag, diaper bag, or even an old purse slung over your seatback can be the perfect storage place for toys for your tots, keeping the body of your car from becoming a giant toy box. Receipt receptacle – Whether your car is used primarily for office business or you’re a mom running all the errands, you will likely generate a lot of receipts that can roam freely if not reigned in. We recommend a specific envelope (folders don’t work as well) for all of those receipts. Like the trash, a nightly (or at least weekly) run-through of those receipts will help you discover which are trash worthy and which may be tax deductible. Trunk organizer – Another storage area in which lots of random clutter is “stored” is the trunk. Having a box, basket, or plastic organizing bin will help keep this area clean. Travel case for errands – You have things to return, mail to post, items to deliver, or donations to make. In short, you have a lot of things you need to drop off in the course of running errands. Why not have a designated bag or box for all those books you need to return to the library and those cans of food you want to donate to the local food pantry? Emergency medical kit – This is not an option. You really should have a kit that includes gauze, triple antibiotic ointment, medications, and Band-Aids at the least. It wouldn’t hurt to keep epinephrine shots or charcoal caps in it either, or other items as your medical needs determine.